Jauja is a real city in Peru. In 1534 it briefly became the nation's provisional capital until a year later Pizarro settled on Lima instead - and it was also located in a rich area, well supplied with Inca food and clothing, which gave rise to its legendary status amongst Spaniards as a "land of abundance and happiness". Lisandro Alonso's film Jauja is set much further south and centuries later in Patagonia in the early 1880s, during the so-called 'Conquest of the Desert' [http://en.wikipedia.org/wiki/Conquest_of_the_Desert] when Argentine forces were carrying out the extermination of the indigenous populace, and 'civilising' the wild terrain with the help of European settlers. 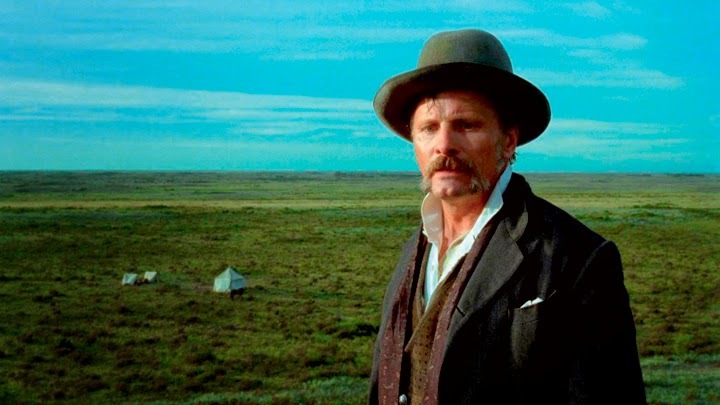 One of the latter, Captain Gunnar Dinesen (Viggo Mortensen; also the film's co-producer and composer), has come with his 15-year-old daughter Ingeborg (Viilbjørk Malling Agger) and a team of surveyors, and is even further from his Danish homeland than from the real Jauja. Yet even if the blood-red text that opens the film makes it clear that the Jauja of the title does not refer to any actual place, but to a more mythic location - a metaphorical space where desires are pursued in vain and lead to disorientation - nonetheless plenty of realities (of colonialism, of history, and ultimately of the filmmaker's own present) come to invade this film's dreamy texture like so many marauding conquistadores. The first scene in Jauja shows Dinesen and Ingeborg sitting out on the Pampas. She is shot head-on, reading, while he is seated by her side faced in the opposite direction, leaning against her, his back to the camera. In the film's very first spoken words, Inge clearly articulates a desire: "Father, why can't I have a dog of my own?" Dogs will recur in the film - stray, lost, neurotic, loyal - but Dinesen's immediate response to his daughter ("You will, Inge - but not until we return home") bespeaks the deferral of satisfaction that is Jauja's very essence. For this film will set its characters on different paths that are always frustrated. Even the wide-open 'desert' landscapes, so full of promise and dread, come constrained by the academy ratio in which they have been shot (with the corners of the image stylistically rounded). Like all the camerawork here of Timo Salminen (the regular cinematographer for Aki Kaurismäki), the opening shot is very meticulously composed, like a painting - and it captures both the intimacy between father and daughter, and the opposing directions in which they are headed. Dinesen cannot wait to be away from this "sh*t country" and back home in Denmark, whereas Ingeborg loves the desert ("the way it fills me"), and soon elopes/disappears into it with her rather diffident lover, the young solider Corto. Meanwhile sly, boorish Lieutenant Pittaluga (Adrián Fondari) openly covets Ingeborg but is slowly realising that he will never, as he so coarsely puts it, "teach her to ride" - and the food supplies that he has been awaiting for months, and that keep being promised by his superior Ángel, may also never come. Amidst rumours that "brave and level-headed…dependable and law-abiding" Colonel Zuluaga has gone native, turned transvestite, and is now leading raids on the countryside with a "band of thieves", viewers might naturally be expecting encounters with an Apocalypse Now-style renegade colonel; and when Dinesen rides off after his daughter, things seems set for a Chilean reimagining of The Searchers (1956). Yet Alonso stirs these desires in us, equally allusive and elusive, only to disappoint them, as he diverts onto more transcendental plains, where fugitive meaning itself becomes the target of pursuit. Jauja is certainly a quest narrative, but the object of that quest turns out to be something more abstract and existential than a girl, or food and water, or a hound. Like the journeying protagonists of Aguirre, The Wrath of God (1972), Dead Man (1995) or anything by Alejandro Jodorowsky, both Dinesen and Ingeborg are cast adrift in an oneiric space of Jungian symbols where history, geography and psychology meet at the shoreline or horizon. By the time Dinesen has entered a rocky cave and engaged in shamanic conversation with an elegant, elderly, Danish-speaking woman who might just be his estranged wife, his daughter or a reflective version of himself, this shaggiest of dog stories has lifted its tail at realism and travelled irrevocably to a different realm altogether - before, that is, a very different coda reintroduces reality in a manner that serves only further to confound our understanding of how exactly we have travelled from there to here and from then to now. Beautiful, haunting and hypnotic, Jauja sees its own legend grow disproportionately, until we all, in our search for sense, get lost on the way. Jauja screened at the Glasgow Film Festival. It will be released in the UK on the 10th of April 15.